Subordinate male pup doing his thing - only alpha's (both sexes) lift their legs. Subordinate males do a "lean forward pee", subordinate females squat. Wapiti pack coats are sweet- they show no signs of sarcoptic mange. The war on wolves reverted to the dark side in the winter of 1905. Switching to one of the first instances of biological warfare ever recorded, the Montana Legislature approved a new law "to provide for the extermination of wolves and coyotes" - from what I can tell sort of like Hitler's Final Solution. I guess paying bounties for hundreds of thosands of dead wolves wasn't getting the job done. Mange was endemic to only the eastern U.S., not the West. The idea was simple and cheap: capture wolves and coyotes, infect them with mange and send them back into the wild. 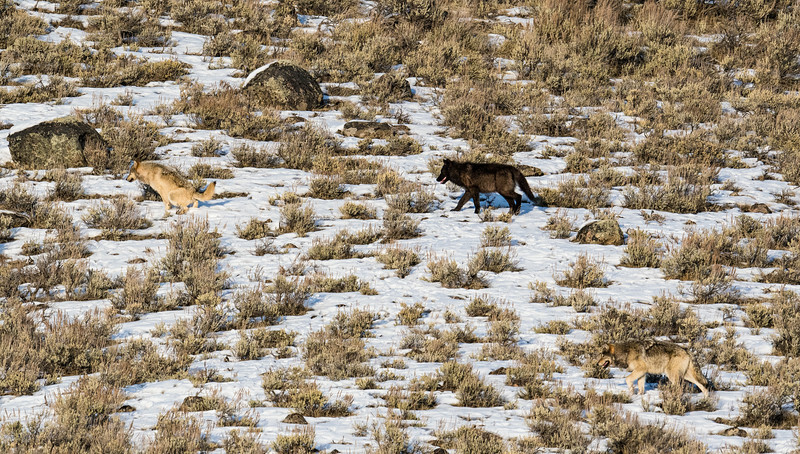 Since the big outbreak in 2007, the northern range has seen little mange in the packs. It can be real hidious when the mite digs into the wolfs hide and causes unmerciful scratching. I have seen wolves with the only fur left is on the tip of their tail, and this at temperatures commonly dropping to -35F. In 2007, wolves with severe mange were observed falling over while sanding up. They had no fur, or very little fur and were actually asleep standing up as the ground was way cold to sleep on. Many died and those that survived often had sever frost bite.